I've come around to the side that's amused by this idea that religion is an endangered species whose fate we'll be deciding on any time soon. The very fact that religious populations are likely to rise in all but the Western world might suggest that even the West will return to being more religious than not over time. When all the Western kids' e-friends who are also Taylor Swift or Zayn Malik fans from other parts of the world are religious you might expect some give & take each way toward some kind of middle. 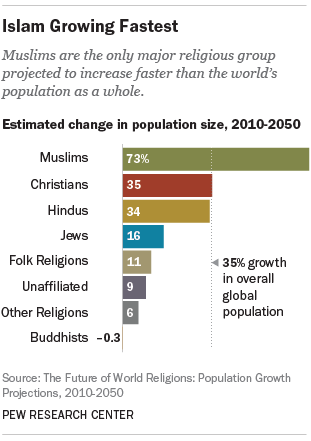 The very fact that religious populations are likely to rise in all but the Western world might suggest that even the West will return to being more religious than not over time. Maybe it'll be a more enlightened type of religion. I am a true believer in thinking in a spiritual way, but I am well aware of the traps. It's complicated. Ah I wasn't trying to necessarily say it was good or bad, just pointing out that the stark reality is that the question "Is atheism worth preserving?" would be better inline with the actual future rather than the exaggerated claims of religions' demise. Huston Smith passed away last Friday. thx for letting us know. awesome guy. rest in peace.